Photo Credit: The AFC. I hope we see more of him! As we approach the business end of the 2019 Asian Cup, with the final in Abu Dhabi just over a week away, we are slowly getting a clear picture of each of the remaining teams. Iran sent a strong message about their intentions with a strong performance against China this morning, while Japan ground out another result against Vietnam to set up one semifinal. Tomorrow morning, we will see what our Taeguk Warriors are made of and whether the Socceroos can join them by taking down the hosts UAE. If you had to sum up Korea’s performance at this Asian Cup in one word, a good one to choose would be underwhelming. The Taeguk Warriors have done just enough of what they needed to do to get this far. While we’ve seen so many wasted chances, we’ve seen enough goals to still remain undefeated. The defense has held up well enough to only concede once. However, the theme of this is just enough. The question is: when will just enough not be enough anymore? With three games remaining, Paulo Bento will have to find a way to get this squad into a higher gear or they will leave the UAE empty-handed. Probably the biggest problem with Korea’s build-up play in the attack is that too often the ball is worked out wide and then an aimless cross is hoofed into the box. In the Bahrain match, there were 30 crosses into the box in regulation time. Guess how many were successful? One. That’s incredibly poor. In fact, Paulo Bento got so fed up with Hong Chul’s play that he subbed him out in extra time and watched Kim Jinsu score the gamewinning header. Hopefully that’s the end of the line for Hong Chul, but will Bento also have the guts to bench Lee Yong? It’s probably hard to bench a man who came up with two goal-creating crosses, but it’s something that Bento should be thinking of. 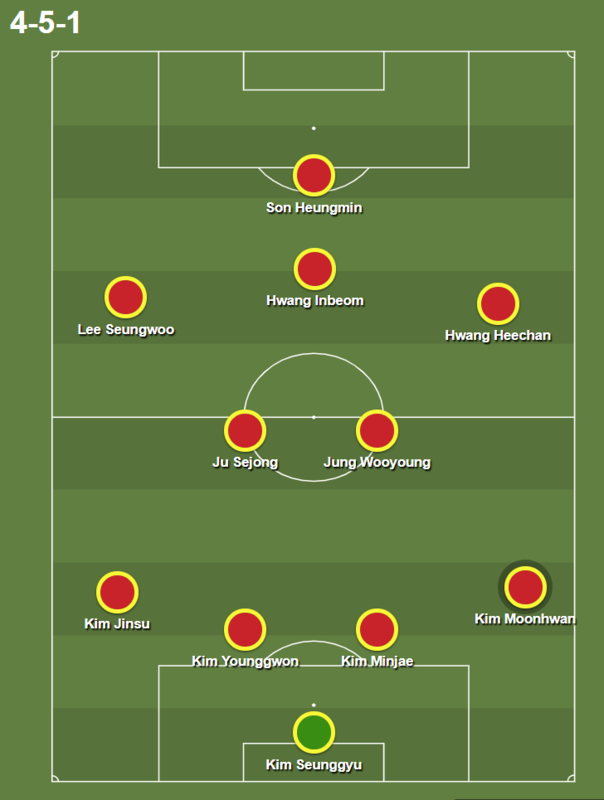 Another concern for the Taeguk Warriors is the squad’s freshness in attack. Players like Lee Chungyong, Son Heungmin, and Hwang Uijo all looked a bit off the pace in the Bahrain match. Bento needs to consider how he can rotate this squad so that his attackers are rested and firing for next week’s finals. Ji Dongwon and Lee Seungwoo should both be considered for starting roles tomorrow and Bento should plan to withdraw Son Heungmin as early as possible. Qatar will certainly be a handful tomorrow. They are the tournament’s top scoring side after they ran all over Group E to the tune of 10 goals and 9 points. They also have the tournament’s top scorer, Almoez Ali, leading the line. Their forward line has the right combination of pace and size to cause any defense problems. However, they did come back down to Earth a bit in their Round of 16 Match with Iraq, only winning on a free kick from Bassam Al-Rawi. Will Qatar continue to struggle in front of goal tomorrow or will they catch the Korean back line out of position enough to bag a few goals? The impression I get from Paulo Bento’s lineups thus far is one of pragmatic conservatism. He’s still falling back on players that have played a lot for the KNT in the past and sticking with them even if their performances aren’t great. As a result, I don’t expect the lineup to change much from what we saw on Tuesday. The only change I predict is Kim Jinsu getting a start after his performance in extra time. However, with the risk of burnout and the stale attacking play we’ve seen so far, I think Bento should make a few more changes. I think Lee Seungwoo should start tomorrow. Lee Seungwoo is a skilled dribbler and one of the things that Yonhap noted about his play Tuesday was that he moved the attack more towards the center of the pitch. He cuts inside more than he looks to play the overlap pass for another cross. 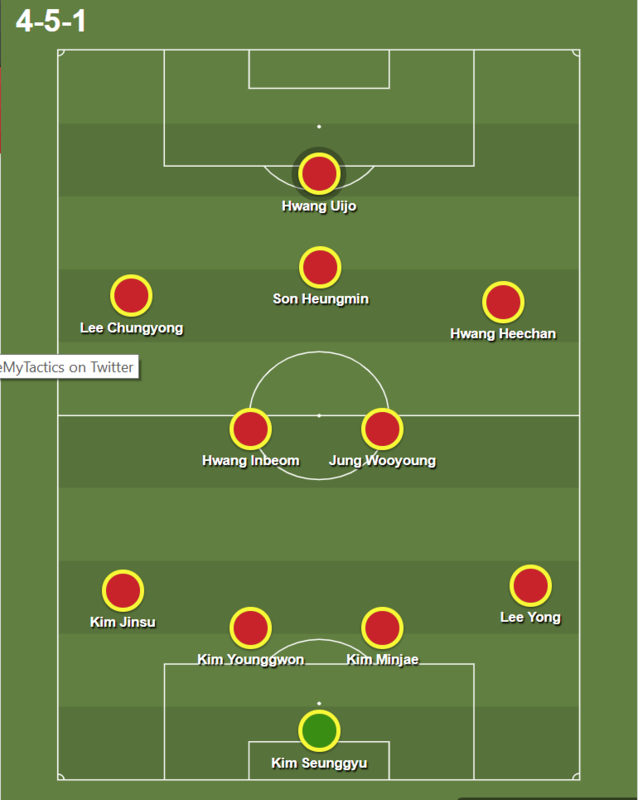 Another way to improve the attack is to move the two most creative players, Hwang Inbeom and Sonny, farther forward. Play Sonny as the striker and give him more chances to score goals and let Inbeom pull the strings more. Prediction: I’m nervous about this one as Qatar has been good this tournament. I’ll go for 2-0, no extra time needed! Let’s get it! Daehanminguk Hwaiting! I’d like to see LSW in there, he’s itching to play. What do you think about Koo Ja Cheol’s chance for playing? Koo Jacheol has a minor injury from training. Wooow Aus lose to UAE in very similar fashion: Dominate possession (even more dominant than SK, more shots), wasteful final third. But 90+9?! Firstly, congrats to Qatar. They never looked scared, stayed poised, and their goal was great. They deserved to win. As for us, I’m just massively disappointed about how subpar we have been since the 2002 World Cup- wow that was almost 20 years ago. Today we can blame Bento. He’s the coach and definitely takes blame. But he just started, and our KNT has only gotten out of the group stage once since 2002, and that was in 2010 where we got destroyed by Argentina and totally outclassed by Uruguay. Bento just started. He didn’t take the team to the 2011 Asian Cup where we lost to our rival Japan in the semis. He didn’t take the team to the 2014 World Cup where we gave one of our worst performances in team history. He didn’t take the team to the last World Cup where apart from the Germany anomaly we were one of the worst teams of the tournament. Quite frankly, our KNT players have consistently underperformed for the past decade, maybe even since 2002. The only other consistency is from how terribly the KFA has mismanaged the entire country from the ground up. It’s sad when our best performance came under Stielke, who everyone still hates, at the 2015 Asian Cup. Yeah I’m pissed. Maybe a more rationale analysis will come in a few days. First of all, Qatar deserved the win. To summarize this tournament, Bento failed. Instead of exploiting weakness of Qatar side, he tried to starve them of ball possession. To a degree, Qataris were getting tired but they were happy to sit and pounce on a mistake. My point of view is that we need to refresh the squad, farewell with old stars and invite young players. But for this we need to develop our school system. If you noticed, we have good midfielders, strikers who are playing for different clubs in Europe, but there is no defender or goalkeeper abroad. It will take some time. And of course, to find a good manager who will care about all layers of football players.